Cooler Master AMD Wraith Ripper Air Cooler - Fits Socket TR4 chips, X399 boards Copyright © 2019 ComXpert International CC - COPYING IS ONLY ALLOWED FOR THE PURPOSE OF SENDING US ENQUIRIES. E&OE. Specialized air-guide armor designed to guide the flow of air for peak cooling performance and reduce dead heat spots on the cooler. The armor is also illuminated by number of addressable RGB LED's for full color customization. 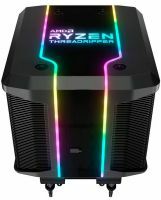 AMD Ryzen Threadripper has up to 32 cores within the package. To ensure heat is transferred and removed quickly and evenly, Wraith Ripper is custom fitted to provide full coverage. Enhanced thermal conductivity and the symmetric layout uniformly distributes heat over the heatsink. Exclusive all-in-one Threadripper mounting design for easy installation. Just screw in from the top, no additional bracket or backplate needed. Cooler Master programs and provides the official AMD RGB software that allows you to take full control of your rig’s lighting and take it to the next level. Gamers, overclockers and content creators can get ready for the most powerful AMD solution yet! Copyright © 2019 ComXpert International CC - COPYING IS ONLY ALLOWED FOR THE PURPOSE OF SENDING US ENQUIRIES. E&OE. CD1004B01 Zerotherm Zt-570D, CPU Cooler with blue LED, Copper heat pipe and fins. The best price and guaranteed service and backup from official computer suppliers in South Africa for the MAM-D7PN-DWRPS-T1 Cooler Master AMD Wraith Ripper Air Cooler. The Coolermaster MAM-D7PN-DWRPS-T1 Cooler Master AMD Wraith Ripper Air Cooler is available for R2005. The product is sold by ComX Computers as new. Prices are valid today 2019-04-24 (before 2019-04-25 , by quote, while stocks last). The product is expected to be in stock, although this is not guaranteed. Find related MAM-D7PN-DWRPS-T1 Cooler Master AMD Wraith Ripper Air Cooler products in our Cooling: CPU Processor Category for even more options. Read reviews and find out about MAM-D7PN-DWRPS-T1 Cooler Master AMD Wraith Ripper Air Cooler. Discounts, specials and cheap prices only at ComX Computers.